260 pages | 7 B/W Illus. Accurate sample size calculation ensures that clinical studies have adequate power to detect clinically meaningful effects. This results in the efficient use of resources and avoids exposing a disproportionate number of patients to experimental treatments caused by an overpowered study. 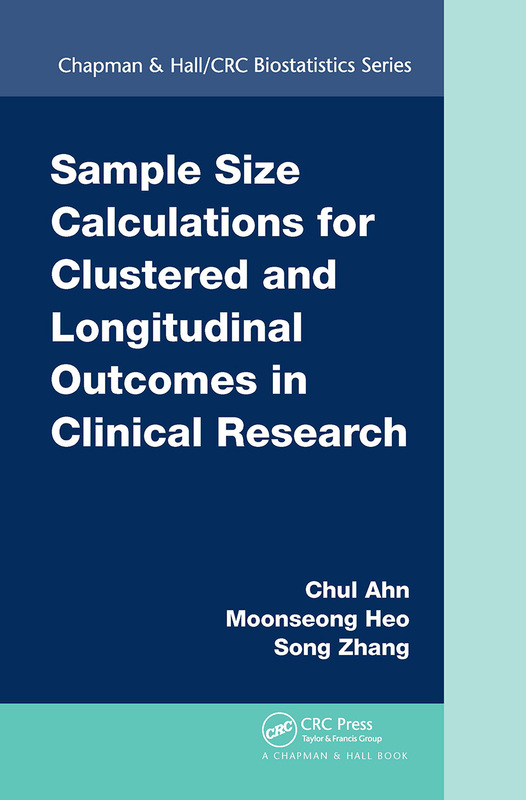 Sample Size Calculations for Clustered and Longitudinal Outcomes in Clinical Research explains how to determine sample size for studies with correlated outcomes, which are widely implemented in medical, epidemiological, and behavioral studies. The book focuses on issues specific to the two types of correlated outcomes: longitudinal and clustered. For clustered studies, the authors provide sample size formulas that accommodate variable cluster sizes and within-cluster correlation. For longitudinal studies, they present sample size formulas to account for within-subject correlation among repeated measurements and various missing data patterns. For multiple levels of clustering, the level at which to perform randomization actually becomes a design parameter. The authors show how this can greatly impact trial administration, analysis, and sample size requirement. Addressing the overarching theme of sample size determination for correlated outcomes, this book provides a useful resource for biostatisticians, clinical investigators, epidemiologists, and social scientists whose research involves trials with correlated outcomes. Each chapter is self-contained so readers can explore topics relevant to their research projects without having to refer to other chapters. "…an excellent resource for both statisticians and practitioners undertaking prospective studies in human trials." " . . . this is a clearly written and sequentially well-organized book. One may find it easy to read and comprehend the various conceptual and methodological issues. To facilitate better understanding, each of the covered topic deals with illustration. I fully agree with the claim of the authors that this book may serve as a useful resource for biostatisticians, clinical investigators, epidemiologists, and social scientists whose research involves randomized trials with correlated outcomes usually classified into two types: clustered or longitudinal." "The book opens with an excellent summary and overview of conventional sample size analysis, including precision and power analysis. . . The book moves on to sample size calucations for clustered data." "This book aims to be a useful reference for those of us who are frequently asked ‘how many people will I need to recruit?’ This text provides a useful reference for those who wish to calculate the sample size for a clustered design . . . clear and accessible examples and some thoughtful reminders of key considerations." Further Readings appear at the end of each chapter.